A plain, reasonable working man supposes, in the old way which is also the common-sense way, that if there are people who spend their lives in study, whom he feeds and keeps while they think for him—then no doubt these men are engaged in studying things men need to know; and he expects of science that it will solve for him the questions on which his welfare, and that of all men, depends. He expects science to tell him how he ought to live: how to treat his family, his neighbours and the men of other tribes, how to restrain his passions, what to believe in and what not to believe in, and much else. And what does our science say to him on these matters? It triumphantly tells him: how many million miles it is from the earth to the sun; at what rate light travels through space; how many million vibrations of ether per second are caused by light, and how many vibrations of air by sound; it tells of the chemical components of the Milky Way, of a new element—helium—of micro-organisms and their excrements, of the points on the hand at which electricity collects, of X rays, and similar things. In 'Modern Science', Essays and Letters (1903), 221-222. Each ray of light moves in the coordinate system 'at rest' with the definite, constant velocity V independent of whether this ray of light is emitted by a body at rest or a body in motion. Annalen der Physik, 1905, 17, 891-921. Trans. John Stachel et al (eds. ), The Collected Papers of Albert Einstein, Vol. 2, (1989), Doc. 23, 143. It is of interest to inquire what happens when the aviator’s speed… approximates to the velocity of light. Lengths in the direction of flight become smaller and smaller, until for the speed of light they shrink to zero. The aviator and the objects accompanying him shrink to two dimensions. We are saved the difficulty of imagining how the processes of life can go on in two dimensions, because nothing goes on. Time is arrested altogether. This is the description according to the terrestrial observer. The aviator himself detects nothing unusual; he does not perceive that he has stopped moving. He is merely waiting for the next instant to come before making the next movement; and the mere fact that time is arrested means that he does not perceive that the next instant is a long time coming. In Space, Time and Gravitation: An Outline of the General Relativity Theory (1920, 1921), 26. My theory of electrical forces is that they are called into play in insulating media by slight electric displacements, which put certain small portions of the medium into a state of distortion which, being resisted by the elasticity of the medium, produces an electromotive force ... I suppose the elasticity of the sphere to react on the electrical matter surrounding it, and press it downwards. From the determination by Kohlrausch and Weber of the numerical relation between the statical and magnetic effects of electricity, I have determined the elasticity of the medium in air, and assuming that it is the same with the luminiferous ether I have determined the velocity of propagation of transverse vibrations. (deduced from electrical & magnetic experiments). This coincidence is not merely numerical. I worked out the formulae in the country, before seeing Webers [sic] number, which is in millimetres, and I think we have now strong reason to believe, whether my theory is a fact or not, that the luminiferous and the electromagnetic medium are one. Letter to Michael Faraday (19 Oct 1861). In P. M. Harman (ed. ), The Scientific Letters and Papers of James Clerk Maxwell (1990), Vol. 1, 1846-1862, 684-6. Nothing travels faster than the speed of light, with the possible exception of bad news, which obeys its own special laws. In Mostly Harmless (1992), 1.
which is E equals M C squared. From lyrics of song Sod’s Law. Published without attribution in Punch (19 Dec 1923), 165, 591. He was later identified as the author, based his claim to have written it, in a letter to The Observer (1937). So, what’s the speed of dark? The layman, taught to revere scientists for their absolute respect for the observed facts, and for the judiciously detached and purely provisional manner in which they hold scientific theories (always ready to abandon a theory at the sight of any contradictory evidence) might well have thought that, at [Dayton C.] Miller's announcement of this overwhelming evidence of a “positive effect” [indicating that the speed of light is not independent from the motion of the observer, as Einstein's theory of relativity demands] in his presidential address to the American Physical Society on December 29th, 1925, his audience would have instantly abandoned the theory of relativity. Or, at the very least, that scientists—wont to look down from the pinnacle of their intellectual humility upon the rest of dogmatic mankind—might suspend judgment in this matter until Miller's results could be accounted for without impairing the theory of relativity. But no: by that time they had so well closed their minds to any suggestion which threatened the new rationality achieved by Einstein's world-picture, that it was almost impossible for them to think again in different terms. Little attention was paid to the experiments, the evidence being set aside in the hope that it would one day turn out to be wrong. Personal Knowledge: Towards a Post-Critical Philosophy (1958, 1998), 13. Miller had earlier presented his evidence against the validity of the relativity theory at the annual meeting, 28 Apr 1925, of the National Academy of Sciences. Miller believed he had, by a much-refined and improved repetition of the so-called Michelson-Morley experiment, shown that there is a definite and measurable motion of the earth through the ether. In 1955, a paper by R.S. Shankland, et al., in Rev. Modern Phys. (1955), 27, 167, concluded that statistical fluctuations and temperature effects in the data had simulated what Miller had taken to be he apparent ether drift. The velocity of light is one of the most important of the fundamental constants of Nature. Its measurement by Foucault and Fizeau gave as the result a speed greater in air than in water, thus deciding in favor of the undulatory and against the corpuscular theory. Again, the comparison of the electrostatic and the electromagnetic units gives as an experimental result a value remarkably close to the velocity of light–a result which justified Maxwell in concluding that light is the propagation of an electromagnetic disturbance. 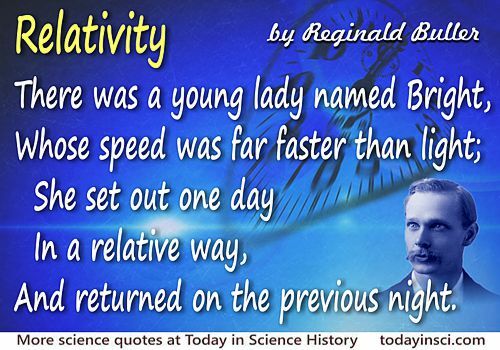 Finally, the principle of relativity gives the velocity of light a still greater importance, since one of its fundamental postulates is the constancy of this velocity under all possible conditions. Studies in Optics (1927), 120.